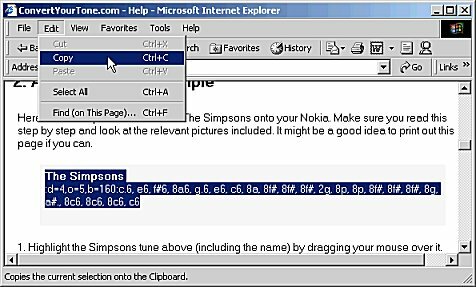 Here's an example on how to load The Simpsons onto your Nokia. Make sure you read this step by step and look at the relevant pictures included. It might be a good idea to print out this page if you can. 1. Highlight the Simpsons tune below (including the name) by dragging your mouse over it. 6. In Box 3, select the Keypresses option. The tune now appears exactly as it would need to be typed in to your Nokia Composer. It should look like the picture below. 8. In the program, select the display as Nokia Composer to compare the program screen with your phone screen to make sure that the tune has been entered correctly. If it doesn't, you have made a keypress mistake. 9. Now go to the Tempo option in the phone (under Composer | Options) and change the Tempo to 160 as displayed in the program. This makes sure that the tune plays at the correct speed. 10. You can then play the tune and save it to the phones memory. You now have The Simpsons on your phone!